NOTE: I am not at liberty to redistribute the documentation used to build this model. This (2013) model is now available in my 3D Catalog, and is fully rigged for animation. Once complete, the 2015 version will be available there too. 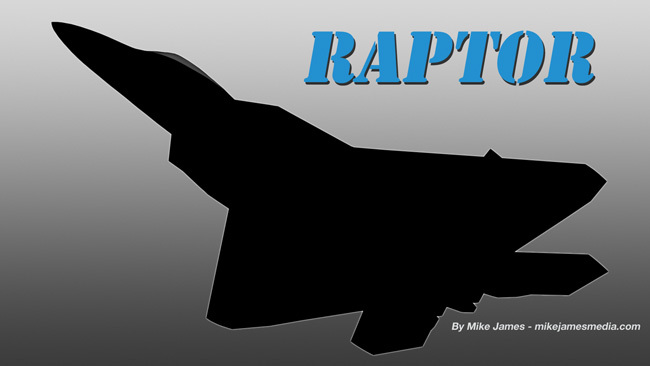 This shortened article discusses some of the research I was doing on the Raptor at that time. The newer 2015 model, which is all Catmull-Clark with edge-weighting, is in a separate article here. The F-22 is a truly remarkable flying machine, with a LOT of interesting details to model. So, as an aviation fan, that makes this project an ongoing challenge, and with each new release of MODO, I feel that i can do a better job of representing this aircraft. My original model was built in 2007, using Carrara 4. When I switched to MODO in 2008, it was the first model I updated, and that definitely improved the quality. I live in Anchorage, Alaska, where we have two squadrons of F-22's, based at Elmendorf Air Force Base. So, I've seen the flight demonstrations by Major Paul "Max" Moga and others. and have photographed the aircraft at several Elmendorf displays. In addition to that, there are now many more photos of the aircraft available on the web, so my documentation has greatly improved. My original article was FAR too long, so I've deleted it, and included a little of the research information in this article, just to give you an idea of the lengths I went to, to select some documentation. Having seen programs like "4195 - The Last F-22 Raptor", I'm extremely jealous. To have been involved in that program must have been an awesome experience. Every aviation fan who has seen it fly is of course, amazed. But, in my research for the 3D model, I've also come to appreciate the depth of the mechanical structure. My dream vacation would be a trip to Lockheed Martin, to ask 1000 questions about the aircraft, and to be able to actually get up close and personal with one. I realize that's impossible, due to the nature of the aircraft, but it's my way of stating my admiration for how this incredible aircraft was built. "Well done" is an understatement. 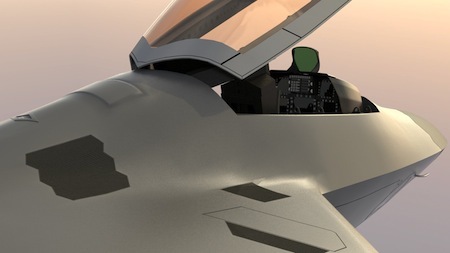 Until a couple of years ago, my usual approach to modeling aircraft in MODO was to begin with sub-d models, and when all the curves are where I want them, I would then freeze the model to hard polygons, so I could use boolean cutters to create doors, hatches, etc.. My earlier F-22 model was that kind of hard polygon model, and with the huge number of sawtooth-edged panels and hatches cut into it, rebuilding the fuselage alone would be a major project. So, to make this worthwhile, I've been collecting more and more information and compiling notes, to be as sure as possible that when I did restart, I'd be ready. Otherwise, it's quite easy to paint yourself into a corner with these shapes. The F-22 is quite frustrating (or "challenging", if you like) to model, and that is entirely a result of what it is... a still-classified, stealthy, tactical aircraft, with very little in the way of "real" publicly-available documentation. In a way, this signifies Lockheed Martin's success, in building an aircraft that looks different from every viewing angle, and disguises it's true shapes very well. If you attempt something like this, be wary of all the documentation... You'll find that virtually all of the images from Lockheed Martin are skewed in one way or another, and many of the "specs" found on the internet are skewed for security reasons, just plain wrong (i.e., from the YF-22) or simply bad guesses. That's just what we have to live with, when modeling this kind of subject. So, photos turn out to be the best form of reference, and I've collected a LOT of them. Even when you're armed with large, high-quality photos, you still have to be very careful, because of several things. First, all F-22's are not the same. Like all modern fighters, they are manufactured in "blocks", with changes made between those blocks. Of course, practically none of those changes are documented for people like us, who create 3D models, to discover. Second, there are many shapes on the F-22 that are (intentionally) confusing. Many parts of the aircraft look like curves, when viewed from some angles, and straight lines, when viewed from other angles. Next, there are the "coatings" applied to the aircraft. Not just "paint", but very strange coatings that further confuse those of us who are trying to model it accurately. In 3D modeling terms, the coating's specularity is affected by incidence angles, resulting in what looks like shiny metal from some angles, and a flat, non-reflective surface from other angles. Then, there are things that the coatings do to intentionally "double-fool" us. For example, sometimes there is a dark color applied where there's a bulge or "bump", and a light color applied where there's a depression in the surface. From many angles, that tells our eyes the opposite of what is true. (Normally, we expect high points to be lighter, due to reflection/specularity, and low area to be in shadow.) And finally, there are almost certainly some things done to the coloration of the aircraft that serve no purpose but to fool us further. Simply put, it's "deep"... I'll typically look at a huge variety of photos, in order to try and get just one detail right, and have moved very slowly on this project. The information below is an excerpt from my original 2008 article, and gives you an idea of the lengths I went to in documenting this aircraft. Since what I found then still holds true today, you might find it interesting. Look at the top edge of the vertical fins, for example. It's not "level", but if you believe that they should be, then that indicates that the whole drawing is tilted slightly nose-down, which makes sense. 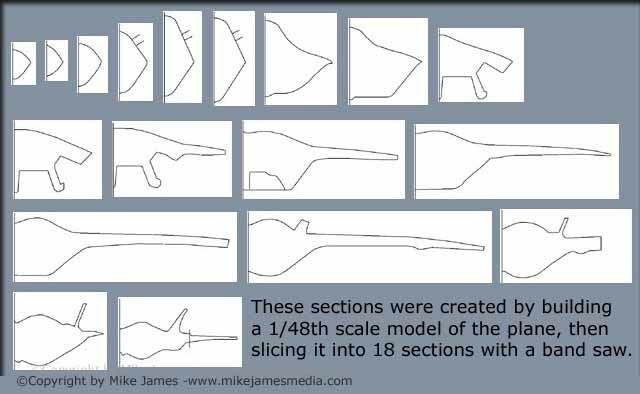 (about 1/2 degree) So, you may want to consider tilting these drawings 1/2 degree toward the tail, for a "cruise angle" alignment. If that sounds too finicky to you, consider that over this aircraft's length, (over 60 feet) the difference in that 1/2 degree tilt places geometry at the nose or tail nearly a foot higher or lower than where it would be otherwise. Alo, remember that if you're doing this to correct an angle based on the landing gear, that the (side view) drawing should be rotated around the center of the main landing gear wheels, since that's what the actual aircraft rotates around, when on the ground. Here's the Lockheed Martin color cutaway, with the opacity turned down, so you can see that the (Lockheed Martin) line drawing underneath it does indeed match. (aside from the landing gear "squat angle", mentioned earlier) That's what made me believe that the color cutaways are a good as anything else, as a reference. The red line passing through the image shows the cruise "datum line" that I believe is valid for alignment of the major parts. Years ago, Revell of Germany made a 1/48th scale model of the F-22, which in my opinion, was the most accurate one I've seen. So, I bought two copies. I built one of them normally, but filled the other one up with expandable polyurethane foam as I built it, so that it would be pretty solid when complete. I then carefully marked it, and sliced it up with a band saw. Finally, I traced those pieces onto graph paper, scanned them, cleaned them up a little in Photoshop, and produced what you see below. Another bonus of slicing up a physical model like this is that it gives you some insight into the interior structures. Here are all of those slices, mirrored and stacked up in Photoshop. Here are the plastic model's cross sections compared to the Lockheed Martin drawings. The 2008 results were pretty good. 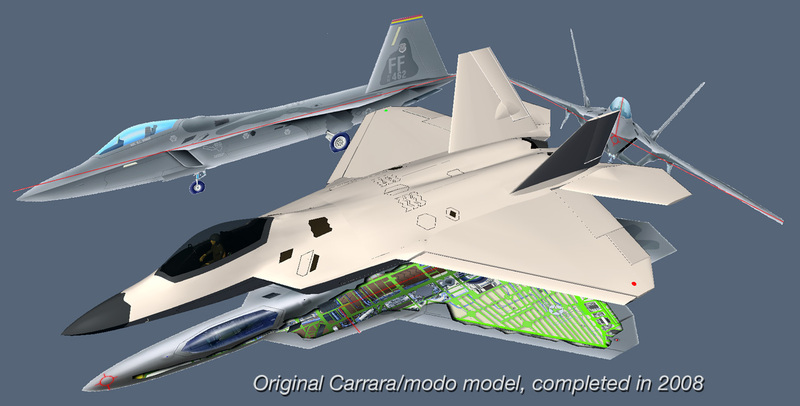 My original (2008) F-22 model (image below) was built over the published Lockheed Martin drawings, and although they are skewed too, they are the most believable of all the publicly-available drawings. So, I'm keeping those as a general reference, and as I rebuild each part, I'll discard the old ones, leaving all new geometry at the end..
Click the "Page 02" link below to continue on with the 2013 model article.